Hello and welcome royal friends! If you’ve made it here from the Scrapbooking Queen’s blog, you’re in the right place, as I’m the last stop of the hop. I have a little bit of a different project for you for this special occasion. While over here in New Zealand, I have really learned to branch out in my creativity and step away from my Cricut and try other types of craft projects other than cards. I must say I have to thank Melody Ross for that, as I’m taking her online Soul Restoration class which includes a lot of collaging and mixed media work. On with my project…a mixed media canvas! I started with painting my canvas. I stroked a few colors of basic acrylic craft paint. 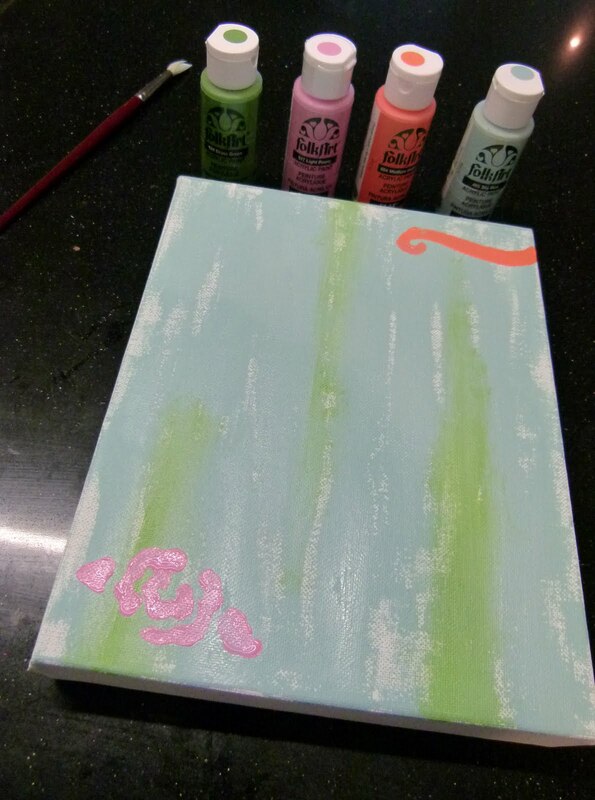 I also used a cheapie stencil to stencil on the pink flower and orange swirl. I didn’t really need it to be perfect as I knew I was just going to be covering most of it up anyway. I then took used white tissue paper and inked it with black StazOn ink using Market Street Stamps Vintage Music background stamp. I then misted it with Perfect Pearls Mist to give it a little color shimmer. See the hole in the tissue paper? No biggie, covering it up. 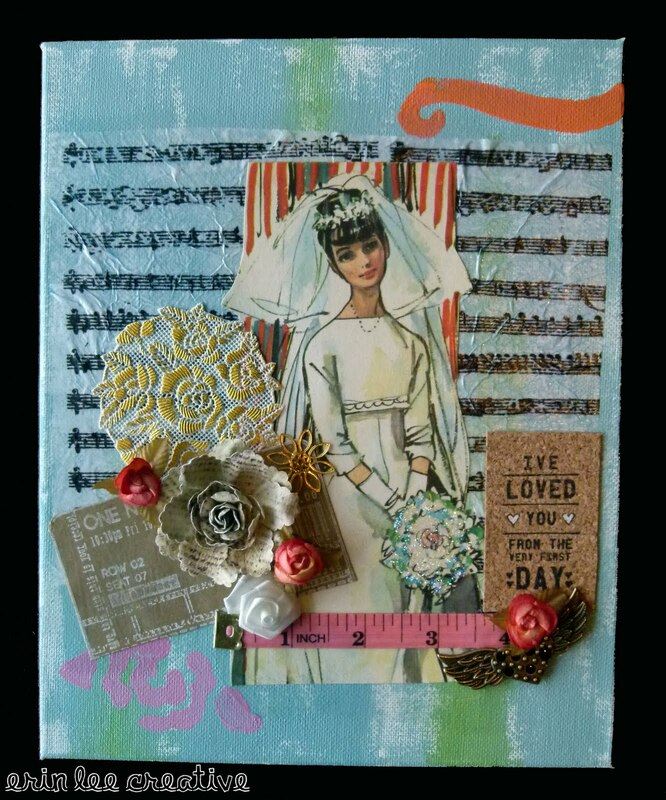 I first mod-podged (my new favorite craft therapy medium) the vintage bride because I wanted her to be my focal point. This bride is from one of the vintage books I found at a flea market. I love my (new) old vintage books for collaging! I used two stamps from Unity Stamp Company’s Kit of the Month and other embellies to finish it up. I’m pretty happy with how it turned out, but I have NO idea what I’m going to do with it – it won’t fit in my suitcase to go home! Maybe I’ll ship it to the happy couple – haha. Now – onto my giveaway! I wanted to give away something special for this blog hop and this very royal event. One of my personal friends has graciously donated a $20 gift certificate to her sweet business, Sweet and Sassy Cakes. She can ship cake pops, cookie pops, fondant cupcake toppers and other yummy personalized and themed treats for your next party right to you. How cool is that? (And yummy!) So for your chance to win, all you have to do is go “like” her Facebook page and let her know I sent you and leave a comment on this blog post. Good luck and thanks for joining our royal wedding hop! And they lived happily ever after…..